Raw Food - A Feast For All the Senses! Do you love food but still want to eat in a healthy way and look and feel as good as possible? Are you a vegetarian/vegan and want to take your nutrition one step further towards radiant health, inexhaustible energy and a crystal clear mind? Do you already eat a lot of raw food but are fed up with boring salads and smoothies? Do you feel exhausted and tired and long for more energy to master your life? Do you have health issues that you would like to solve in a natural way? Would you like to reach and keep your ideal weight yet still enjoy your food without having to count calories? If you’ve answered yes to any of these questions, then you have come to the right place! 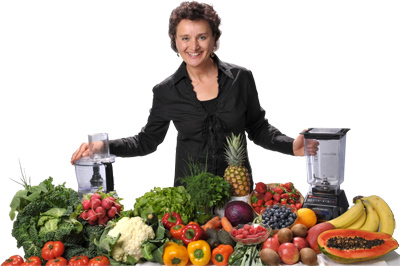 I can show you that healthy raw food is not just about boring salads, carrot and celery sticks, apples and bananas. I am thrilled to be able to show you a whole new world of gourmet raw cuisine, that tastes divine and at the same time takes your health into unexpected dimensions. A way of eating that is not only delicious and easy to prepare, but also gives unlimited energy and radiant health. I can show you that healthy raw food can be a feast for all the senses! Follow me to the fascinating world of gourmet raw food. I look forward to seeing you there.